There were no rain dates, so as of now Aug 21 is the last. But I am still hoping for an encore on the following Fridays. Stay tuned! 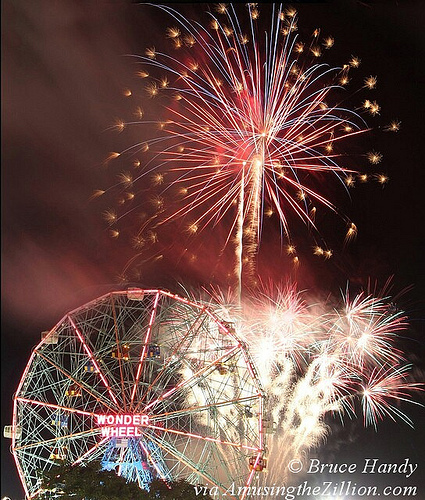 Thanks to Coney Island’s City Councilman Mark Treyger, the Friday night fireworks have been extended to include August 28 and September 4. There are Saturday night fireworks on August 29 and September 5 after the Cyclones games. It shows that it might rain tomorrow, if so, will the fireworks be cancelled? Keep up the fireworks. They were spectacular last year,’ hope to make it this year! The twitter page shown to check on firework cancellations is not up. The fireworks show is a go for tonight, September 4th. I think you misunderstood. The twitter link shows all of the official Coney island tweeters posts. It is not specifically a link about fireworks. IF a fireworks show were cancelled on any Fri night, there would be a tweet saying it’s cancelled. If you scroll down the tweets on that link you will see tweets about tonight’s fireworks. Enjoy the show!